The Aurora shooting wasn’t “shocking.” It was inevitable, given our lax gun laws. 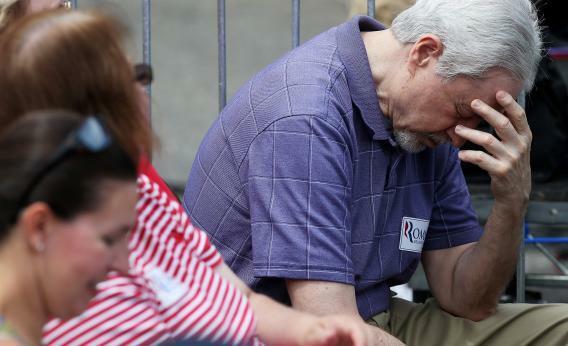 A man pauses to pray for victims of the Colorado shooting during a speech by Mitt Romney in Bow, N.H., on July 20. The words of sympathy from our nation’s leaders in response to the horrific events in Colorado last night are welcome—and we all share the sentiments. But I disagree with one word that both president Obama and former Gov. Romney used to describe the tragedy—the word shocking. The one thing this horror is not is shocking. After the litany of mass shootings we have had over the past years, we should by now be braced for this tragedy, not shocked by it. No one should be shocked, just as we should not have been shocked by the killing of seven at Oikos University in April; or the school shooting in Chadron, Ohio, in February; or the Arizona shooting of Rep. Gabrielle Giffords and 18 others—killing six—in 2011; or the Virginia Tech massacre in 2007; or the Columbine shooting more than 13 years ago. It depends on which study you choose, but there are about 10,000 gun murders in the United States every year. According to USA Today, there are on average 20 mass shootings per year. And according to the Brady Campaign to Prevent Gun Violence, every day in America, guns claim 84 lives and wound nearly 200. Yet somehow, gun control in this country has become the third rail of politics. Perhaps that is partly due to the fact that the public seems to care less and less. According to Gallup, in 1990 almost 80 percent of Americans said that laws covering the sales of firearms should be made more strict. By 2010, that number was only 44 percent. In fact, starting in 2009, the majority of respondents said gun laws should either remain the same or be made less strict. And I am tired of hearing that the Second Amendment as a bar to useful measures—it isn’t. There is no constitutional right to buy submachine guns or silencers or uniquely hazardous bullets without background checks—or at all. So let’s act, not just wring our hands. It is time to ban all military-style semi-automatic assault weapons, ban assault clips holding more than 10 rounds, and require that new guns have micro-stamping technology so bullets left at crime scenes can be traced. These are simple, moderate steps. This tragedy is not shocking—it is a reminder. A stark reminder of our inability to do what so many other nations have done: Put in place meaningful gun control.